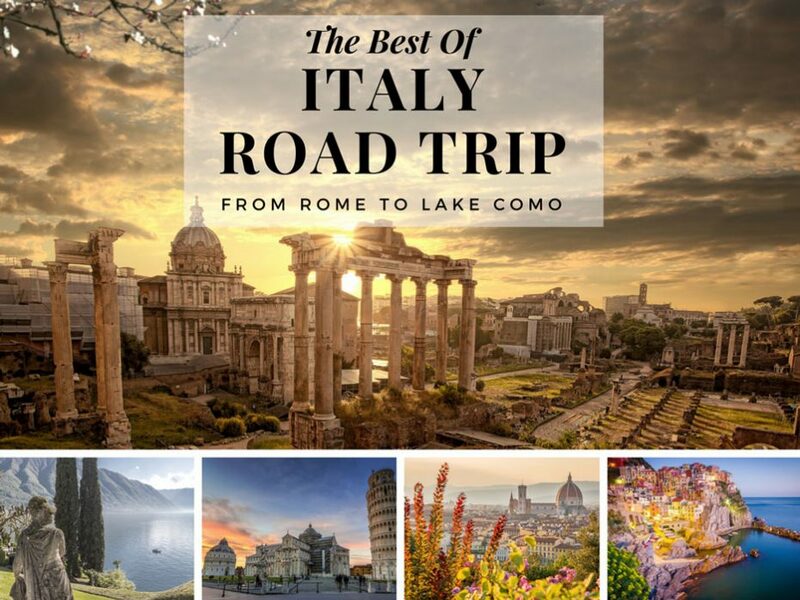 BLOG ITALY ROAD TRIP: Your Italian Itinerary By a Local! Ah, Italy… my country, my pride, my love! Being Italian is truly a privilege, so let me transfer a bit of my knowledge to you, with some cool tips to have the best Italian trip experience of your life! 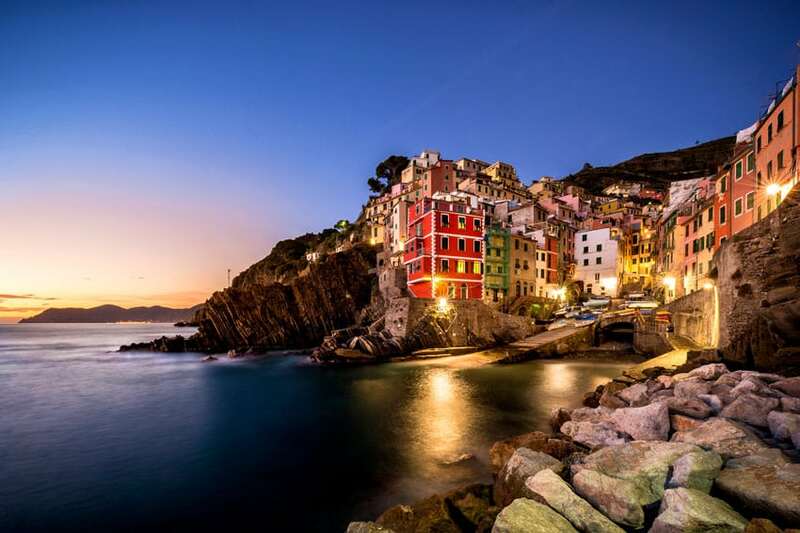 Starting from Rome, my favorite city in the world, through the geen famous hills surrounding all the Tuscany and Umbria regions, not to mention the jaw dropping view provided by the Cinque Terre – What more can you ask from a country? Italy is simply magnificent! If you want to have a truly amazing Italian experience: Road trip is the main word! Nothing beats an Italian Road trip, trust me. I took my driving license in Rome (crazy, I know!) and from there I discovered every region by car. Slowly, savoring the panoramic scenery that only my beautiful country can offer. Using the train is also a great option but nothing beats driving around Italy! Watch the video of this two weeks Italian Road trip itinerary! The main cities are well connected but I suggest you take as many detours from the highway as possible because it’s driving across the countryside that you will find the real hidden gems of Italy! A word of advice: You might want to see as much as possible during your epic road trip, but in my opinion is better to pick just 3-max 4 cities or villages you don’t want to miss for any reason and leave the rest as a last minute choice. SECOND WEEK + BONUS TIP TO SAVE MONEY! How to save money when booking your hotels! So, What is The best Italian road trip itinerary? I’m Italian and before leaving my beautiful country to travel indefinitely I explored it by car extensively, discovering every single Italian region, so we can safely say that you are in good hands here! From Rome to Milan, ending in the enchanting setting of Lake Como for a 15-day epic journey that you’ll never forget. I promise! Without further ado, here are the breathless places you must include on your Italian road trip. 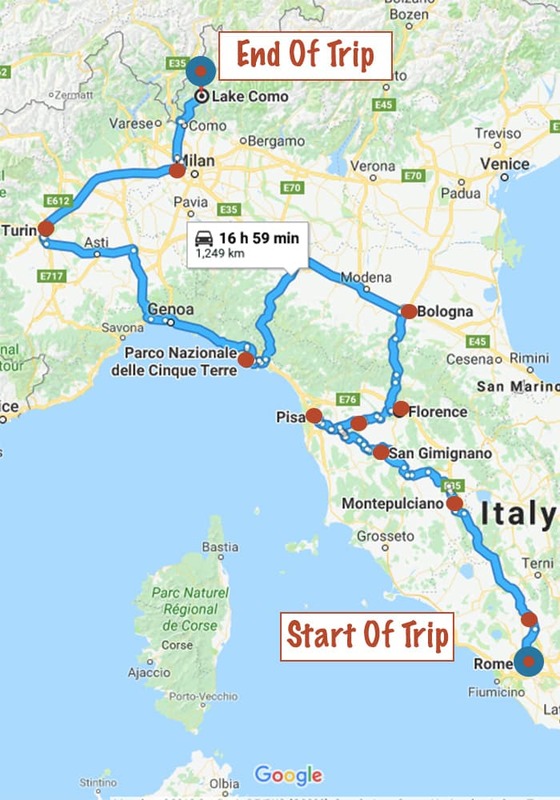 An article about a road trip in Italy wouldn’t be complete without showing you the map of the itinerary with the starting point, stops on the way and ending point of this awesome trip along Italy. Depending on what kind of flights you find, you can obviously do it in reverse, starting from Milan, with a little detour up north to Lake Como and back. It’s just 1 hour and 30 minutes to get to Varenna, on a very nice route as well) and then go back to Milan and start your Italian tour heading south and departing from Rome Fiumicino airport. Ah, Rome – It always makes me wonder: Is there a way to describe this city without using clichè words? 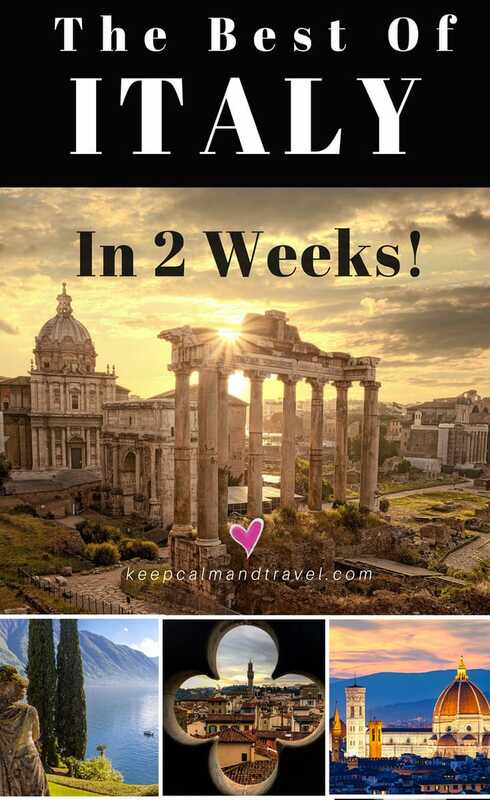 I lived in the eternal city for more than 3 years and I love it (and hate it) to pieces 🙂 Even if Rome is the most predictable stop of this Itinerary, a trip to Italy wouldn’t be complete without a stop in its Capital, right? It would be like spending 15 days in the UK and not visit London. Well, for as much as I love London too… Rome is … Rome! Yes, being Italian I’m biased but not without reason! Is it possible to have a glimpse of the beauty of Rome in one day? Definitely yes! I was even able to see the main attractions in the center, rushing a bit of course, in just 5 hours one time! I always find the time for a quick pit stop to Rome and every time I discover something new! I took two days to explore the inner part of the city – which gave ample time to also include a day in The Vatican City. Enclaved within the city of Rome, Vatican City is officially the smallest recognized state in the whole world. Home to the Pope, the Vatican is the beautifully preserved state of the Catholic Church. It is definitely worth a visit! Take a tour of The Sistine Chapel. Visit the Vatican’s beautiful gardens. Admire it from the top of the St Peter’s Dome! I could say it’s one of the best places to stay on a road trip to Rome. Gianluca, the owner, is very helpful and will give you all the info you’ll need to spend the best time in Rome. Everything is clean and well arranged, the location (Via Veneto, in the center) is perfect for taking public transports or walk around to the main attractions, and most importantly: It has the parking option. Trust me: in Rome, you WANT to have that option. Finding a parking spot is a nightmare for everyone living or visiting Rome. Click to Check the Hotel out! Beautiful Castel Sant’Angelo, another spot (among the endless landmarks in the eternal city) you can’t miss! Tips: Go there at sunrise… trust me, I did it and it was SURREAL, to say the least! Hop On-Hop Off Ticket: Super Touristy, I know, but when you don’t have much time is so worth it! I remember hating that red bus and I ended up loving it when I had only one day in Warsaw and I managed to see it all (at my own pace but they don’t miss the important spots). Check it out! 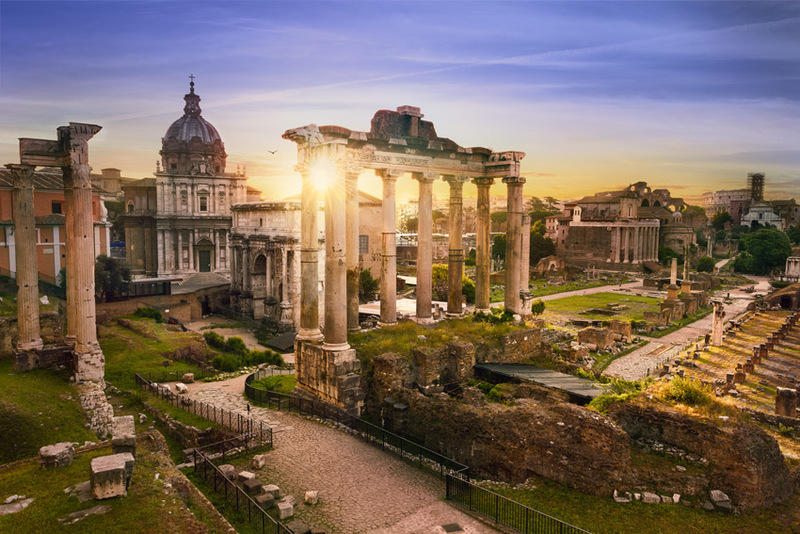 Three Hours evening Walking tour: As Suggested, Rome is even more magical at sunset, so this tour will take you to the main attractions and to the Pincio Terrace right at sunset (I love that spot, you’ll see!). Highly recommended as the guides are usually locals. Check it out! Other Tours in Rome: There are a million tours I could recommend, but you can check them out in here or below (click for more tours on the list) and see if something strikes your attention, I love this website and it’s the one I use the most when I have to book my tours online, super convenient and hassle-free. I don’t like to spend my precious time waiting to buy my tickets especially in super touristy cities like Rome! The “Skip the lines” tickets are exceptional, and you won’t regret buying them as they will save you SO MUCH TIME! Rome itself has many sites to see even just outside the city itself! Roman Castles (or as we call it “Castelli Romani”) are an opportunity to leave the metropolis and immerse yourself in the natural and artistic beauty of the small medieval villages outside Rome. Leaving Rome, you can drive by the ruins of the Baths of Caracalla and onto the Ancient Via Appia by the Church of Domine Quo Vadis. 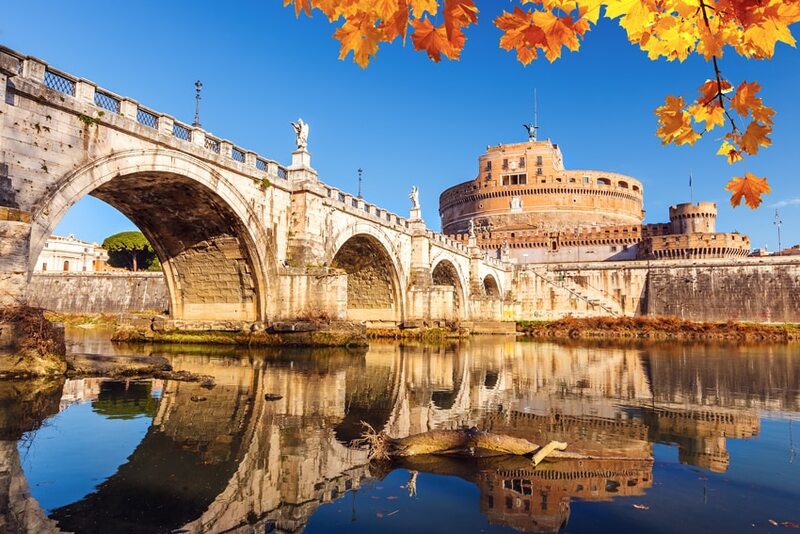 This tour of the Roman Castles will take you along the ‘Road of the Lakes’ through one of the hilly areas of volcanic origin that characterize the outskirts of Rome, the Colli Albani, with its many growing villages. 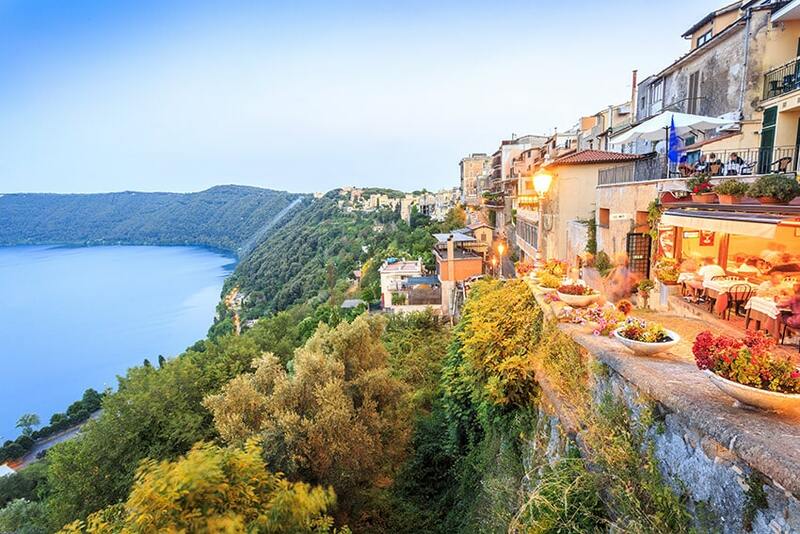 Castel Gandolfo: On the shores of a volcanic lake, this is the village where the Pope has his summer residence. You’ll enjoy a stunning view over the lake and a great but tranquil atmosphere. They are very interesting villages to visit in the Roman Castles’ area. Both are known for their culture, sights and gastronomic delicacies, which include the traditional “porchetta”. Frascati: Towards the northerly part of the Colli Albani, you can reach Frascati, popular with visitors both for its beauty and considerable wine production. Here you can stop for a taste of local wine and products in a local tavern and absorb the flavor of the real village life in the Lazio region. A super nice hotel, central and with amazing views over the lake, the owner Francesco is super friendly (like most of the people from Rome and surroundings! ), breakfast is included and a parking space is available too, mandatory for a stress-free Italy road trip, right? 🙂 Click to Check the Hotel out! I’d like to take credit for “finding’” this town, but I accidentally stumbled across Montepulciano, the medieval town in lovely Tuscany hills by complete accident. It was a ridiculously beautiful town to stumble upon, providing a welcome opportunity to fill up on some fresh Bresaola and a little wine (for the non-drivers of course). 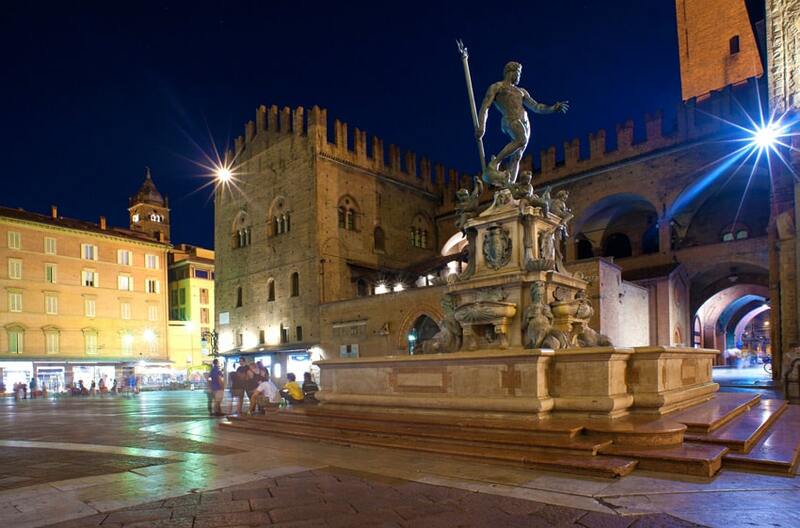 The Main Square: With its lovely fountain on the side, the Duomo and Palazzo Tarugi and Palazzo Contucci. 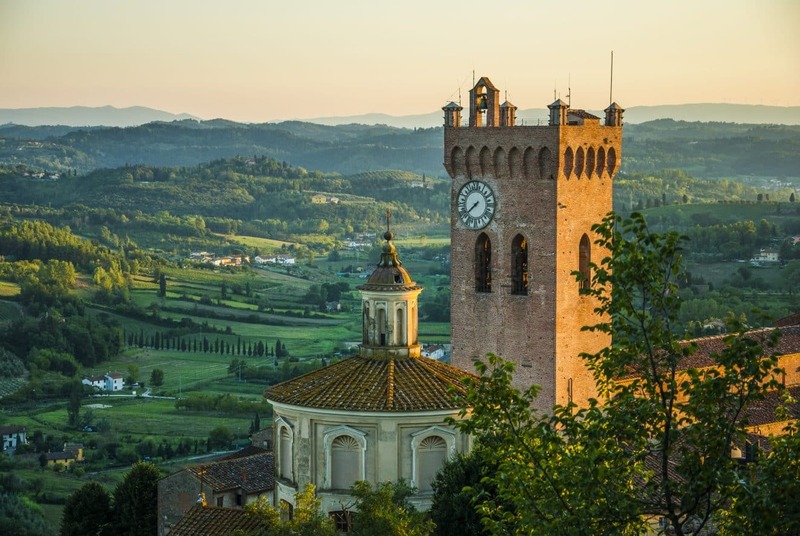 Palazzo del Comune Tower: Do you want to admire the incredible views of the Tuscany Hills surrounding this lovely village? climb the Tower and you won’t be disappointed! Gate Porta del Prato and Corso street: Almost every medieval village in Italy has a main gate to the town, cross “La Porta del Prato” and stroll around the Corso street, with its lovely shops and elegant palaces and renaissance buildings, the church of Sant’Agostino and the Palazzo Cervini. Located within the medieval walls of Montepulciano, this hotel is quite special! Built in the 16th-century, it is the oldest hotel in town. It has a bar, free Wi-Fi, and rooms with views of Lake Trasimeno or the town and free parking 🙂 Click to Check the Hotel out! Being a very small town, after you have admired its historical center, there are many activities you can book for an even more memorable experience! Montepulciano Terme: Wellness & Wine Experience: Honestly? According to me, this is an absolute must (I’m an SPA and wine lover), after driving and walking for hours, you deserve a bit of relax! Check out this amazing experience in here. 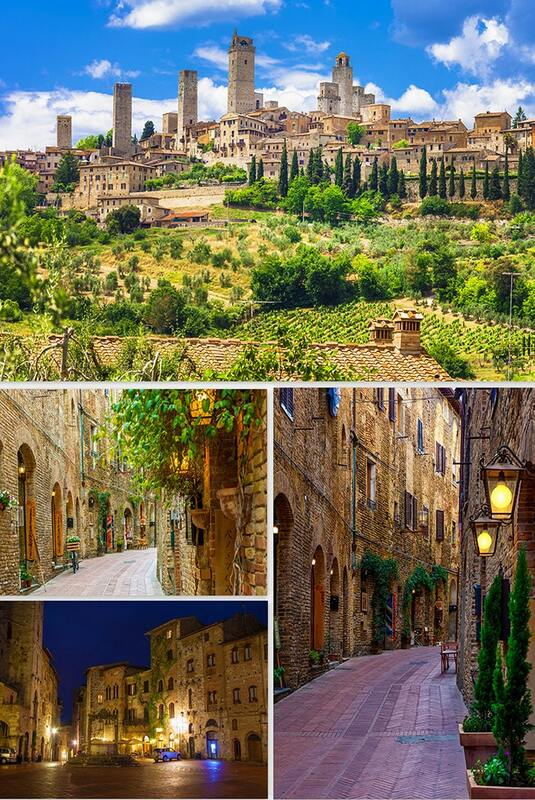 Montalcino/Pienza/Montepulciano Full day wine tour: This is one of the best selling tours in the area and within reason! If you want to relax 100% and see 3 lovely villages instead of one (while tasting the best wines in the region) this is it! Check out all the details in here. 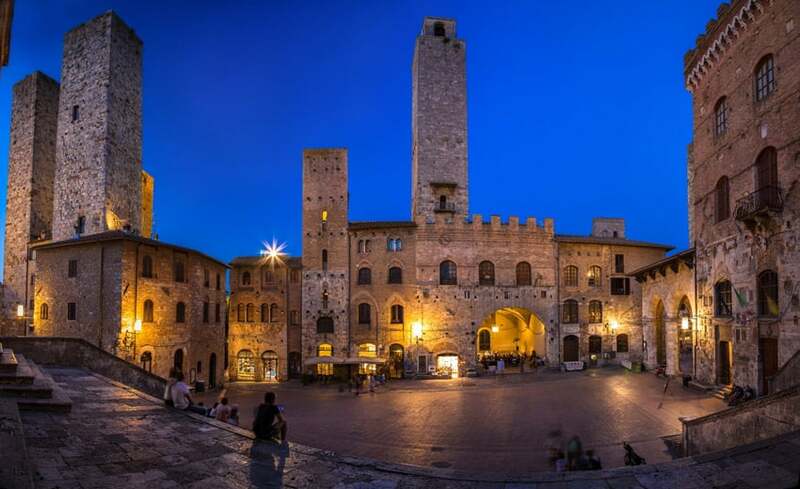 While many visit San Gimignano, the town declared by UNESCO to be part of the World’s Architectural Heritage, for a very short time, there is plenty to do to keep you busy an entire day if not more! I had the luck to discover the town I have declared the loveliest of the entire Tuscany Region during a Road trip from Rome to Florence. It was a super dark and rainy day but my first reaction when I left the car in the spacious parking lot just before the town walls was: WOW WHAT IS THIS PLACE? As soon as you enter San Gimignano you will feel like time has stopped and you are either back to the medieval era or in a lovely fairy tale! 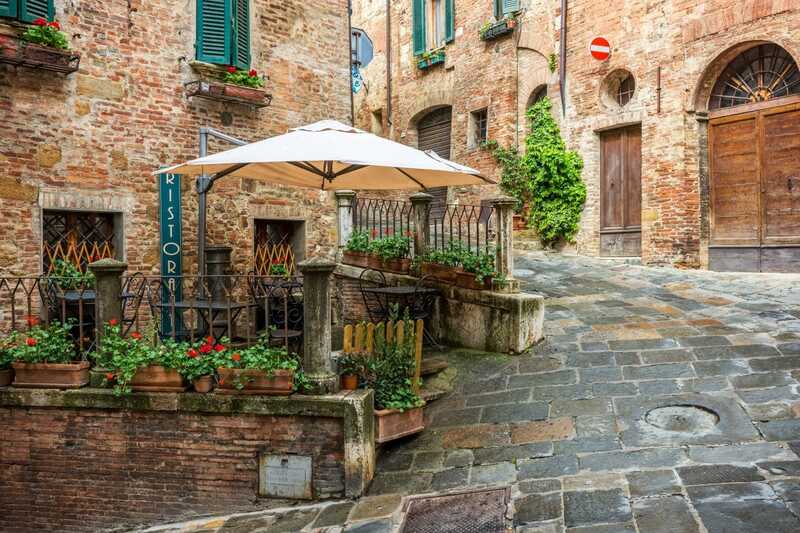 A stroll down the entire town is required, as well as a visit to the Duomo di San Gimignano and to the Palazzo Comunale to view the Pinacoteca of Medieval art. Torre Grossa views: Climb to the very top of the Torre Grossa, the tallest tower in town to enjoy the best view of San Gimignano ever. The green hills and spectacular Tuscany landscape will make it worth the effort! Montestaffoli Fortress: Climbing up to the remains of the Montestaffoli fortress and lots of tastings of the local white wine, Vernaccia di San Gimignano, will round up your unforgettable visit to San Gimignano. You will fall in love with the town, I promise! One of the best hotels in San Gimignano! You’ll have everything at your doorstep: public parking just 50mt away, breathtaking views from the windows and the location is superb, right in the city center. This hotel will be the cherry on top of your already amazing experience in San Gimignano! Click to Check the Hotel out! There are many tours but they depart from other cities like Siena to visit San Gimignano, but since you are on your epic road trip, you don’t need those! The only one I feel I can recommend is actually a “detour” or a secondary option to your Itinerary. Visit Pisa and Lucca (and climb the lining Tower): Your next stop on the map should be Pisa, but what if you want to slow down and stay a day more in San Giminiano? after all the beauty of these road trips is that you can change your itinerary on a whim. With this tour you’ll see both Pisa and Lucca, you’ll climb the famous lining tower and be back to San Giminiano for another awesome night before resume your driving again the next day, heading to Florence via San Miniato. If you like this alternative Itinerary, check out the detail of the Tour in here. An obvious choice for any visitor to Italy! Pisa and its famous leaning tower has become a symbolic representation of Italy across the globe. Yes, I did it too… so why I didn’t put it in here? Because when I went there the digital cameras didn’t exist yet so we used the whole film to try and be in the right position for the photo. Only one had the right angle but it was super blurry! If you want to rest up and spend the night in Pisa this is the perfect hotel for you, right in the city center, a mere 5 minutes walk from the leaning tower, it provides a parking space on site, buffet breakfast and has great reviews 🙂 Click to Check the Hotel out! San Miniato is a gracious small town which is perfect as a quick (or long, it’s up to you!) pit stop on your way to Florence. San Miniato has always given a warm welcome for (friendly) travelers! Hence why you should go!  As the main town was a major thoroughfare for medieval traders between Rome and the rest of Europe, San Miniato became shaped by its constantly changing population and exchange of exotic and sought-after goods. Since this is YOUR road trip, you might decide to spend the night in San Miniato, in this case, I highly recommend this hotel, located in a former convent, it offers free parking space and even an SPA and wellness center to recharge your batteries 🙂 Pisa and Florence are only 45 min away by car! Click to Check the Hotel out! I love visiting certain cities more than once, with Florence being one of my favorites for this …I was 20 when one lazy afternoon we decided to hop on the first train available from Turin (I was studying at University at the time) to visit this glorious city! It was a rather cold October weekend and we even slept without a tent at Piazzale Michelangelo, an amazing spot with amazing views of the city from the hill. Florence may well be an obvious choice to include on a road trip to Italy, but don’t let its popularity stop you from visiting. In fact, it’s never stopped me, each time is completely different and unique. This beautiful Tuscan city with its super friendly people has SO MUCH to offer that two days should be the minimum to fully enjoy it. The Uffizi: If you Love renaissance art, a stop at the Uffizi is mandatory. Obviously, the lines the get in are insane, but once inside your jaw will drop from all the beautiful paintings by Botticelli, the statues, and the whole atmosphere. 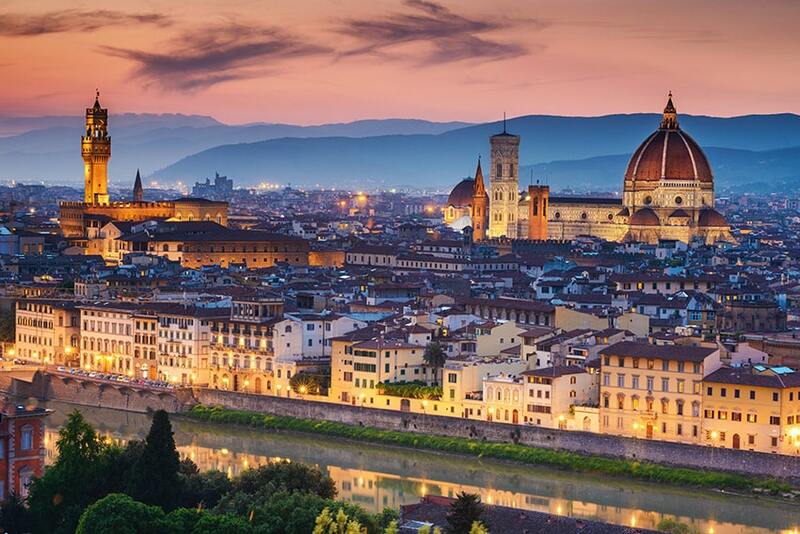 Piazzale Michelangelo: Especially at sunset, it will give you the most incredible view of Florence from above. Perfect for photography lovers. If you go there, think about me sleeping with only a blanket on the ground, what an epic trip! Giardini di Boboli: We spent a whole afternoon in there and you can’t miss them for anything in the world, the main word here is GREEN. So much green, and fountains, groomed trees, statues and hidden grottos. Go there and … RELAX! Visit the “Duomo: Famous for its red-tiled dome, colored marble facade & the Giotto tower. A beauty for the eye and impossible to miss when strolling around the beautiful historical center. Santa Croce Church: With its gothic facade and the ample plaza is a very well known landmark in Florence, famous for being the place where you will find Galileo and Michelangelo’s tombs. Ponte Vecchio: The oldest and more peculiar bridge in Florence, it still houses many jewelry shops and buildings, a typical practice back in the day. It is very suggestive to walk by the bridge or over the Arno river banks especially at sunset to admire it from the “outside”. Ponte Vecchio at sunset. Such a peculiar and beautiful bridge. You won’t see anything like this anymore in Italy. This hotel has the most perfect location. 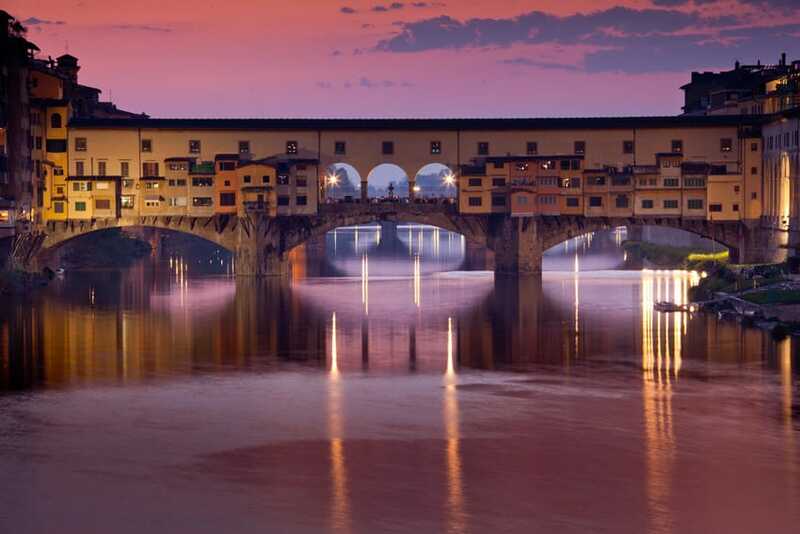 Situated at the very end of the famous Ponte Vecchio bridge it is so easy to find. The hotel is very clean, it has a parking space available. and the rooms have a super view of the entrance to the bridge. Breakfast is served on the terrace on the 6th floor offers a lovely view of the Duomo and Florence skyline. What more can you ask for? Click to Check the Hotel! If you are staying for two days in this magnificent city, you will have some spare time to choose among some of the coolest tours around. Since there are so many ones to choose from, I put some of my favorites below and you can check out more tours by clicking on the whole list. One I strongly recommend? The “Fast line” ticket to enter the Uffizi Gallery! You don’t want to waste your precious time waiting in an endless line and this will make you skip it, allowing you to discover a lot more of Florence. 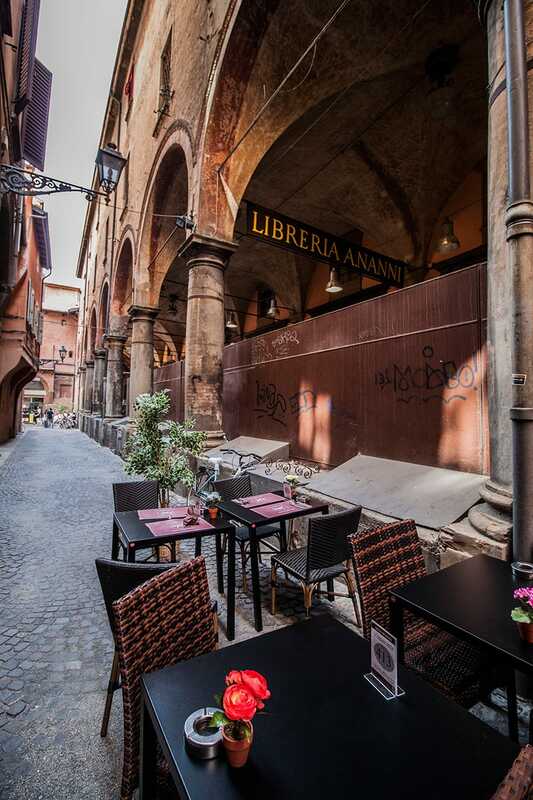 Often neglected on travel itineraries in favor of Italy’s more famous hotspots, Bologna nevertheless has plenty to offer tourists, from food (ah the food guys!!) to art and hidden secrets. Bologna is known, in Italian language as “la Dotta, la Rossa e la Grassa”: “the educated one” in a nod to its university, Europe’s oldest; “the red one”, in reference to the terracotta hues of its buildings and the city’s historic communist leanings; and most importantly, “the fat one”, in reference to the delicious food. I give you one day in Bologna /Emilia Romagna only because I had to stay within the 2 weeks Italy Road trip Itinerary, but if you are free to change your plans a little (or you are lucky to have more time) I would strongly recommend you to discover Emilia Romagna for at least 3-4 days. I have written a great article about “What to do in Bologna and Emilia Romagna” I’m sure you’ll love it, I tried so many things and the pictures speak for themselves! The Markets: The markets in the center are great for fresh fruit and pastries, Via del Pratello is a great spot for lunch, and the student area near Via Zamboni has plenty of options for a filling aperitivo – but really you can’t go far wrong wherever you choose to eat. The Two Towers: Believe it or not, but Bologna’s leaning tower will put Pisa’s to shame! The Two Towers are an iconic symbol of the city, and the shorter one, the Garisenda Tower, leans much more dramatically than Pisa’s leaning tower. It is so famous in Italy that Dante invoked the tower in his Commedia, so look out for the plaque with the quote. Giardini Margherita: One of my favorites spot in Bologna to chill and relax to end the day after walking its gorgeous streets! You will find mostly local people and there are so many hidden spots for a nice picnic while seeing the turtles in one of the ponds inside. Highly recommended (and easy to get there by bus too. Visit Ravenna: Lovely city easily reachable by train for a one day trip and famous for Dante’s remainings and the many stunning churches. Terme Della Salvarola: I told you I am an SPA Freak 🙂 I’m telling you…This place is heaven on hearth. Try the cherry bath and the cherry massage and I assure you that you have to force yourself to leave that place! The beauty of the Apennines in Emilia Romagna. The tranquil landscape you can admire at Lake Baccio! Super nice hotel very centrally located, private parking garage in limited travel zone is very helpful (especially since you are on a road trip!). Friendly staff and good recommendations. Great breakfast with lots of choices. Rooms are nice and clean with comfortable bed, crisp linens and lots of amenities. A little pricey (But you could save money with a free tool… more on it later, stay tuned!). Check this Hotel! 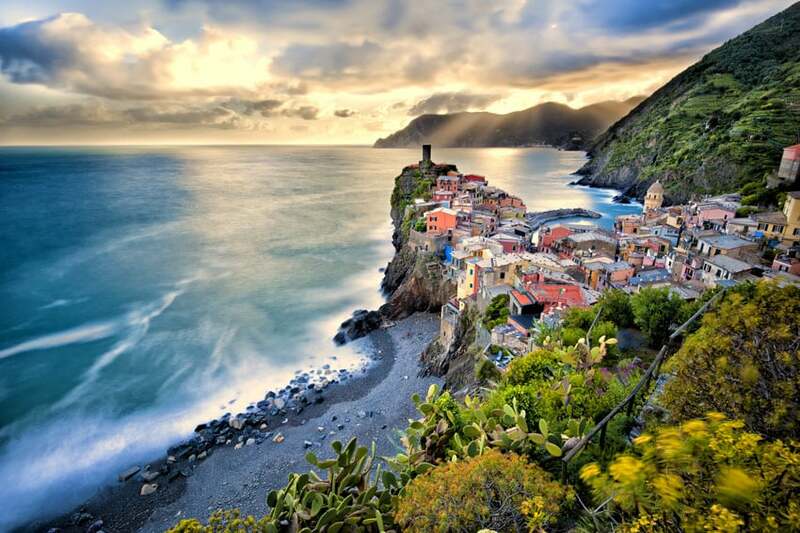 One of my favorite coastlines in Italy and a must-see on any road trip around Italy, Cinque Terre national park is an area around 1.5 – 2 hours’ drive north of Pisa. 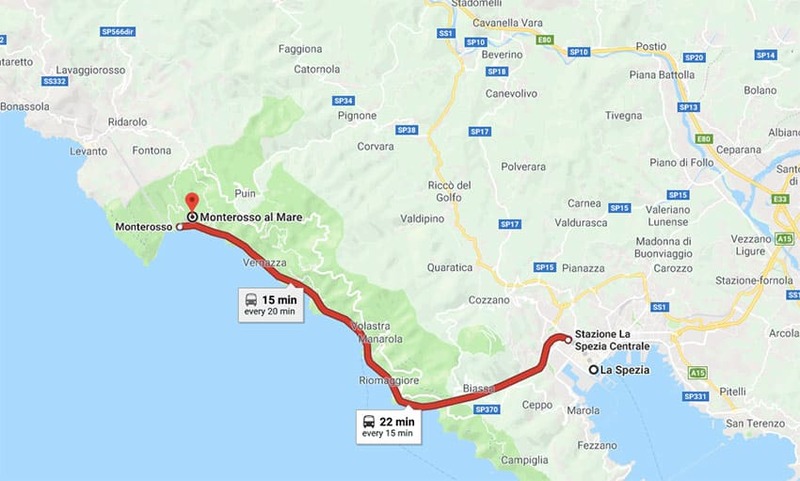 One of the best tips I’ve learned so far is to leave the car at La Spezia Town and take the train between these 5 towns. It’s usually the easiest way to discover them without the issue of finding a parking spot (Unless you decide to choose one of the villages to stay for the night). Obviously the main attractions of the Cinque Terre National Park are the famous villages, so let’s check them out in detail to see what distinguishes one from the other, they are all marvelous and unique! 1) RIOMAGGIORE: The most southern village of Cinque Terre, Riomaggiore is a beautiful town to sit back and enjoy your afternoon. Grab some local foods (especially fried calamari) from the street vendors and head straight for the rocky harbor front. Special tip: spend a good few hours dipping your toes into the sea! This town is a particularly glorious place to watch the sunset from and perhaps even jump into the sea to cool down from the scorching Italian sun. 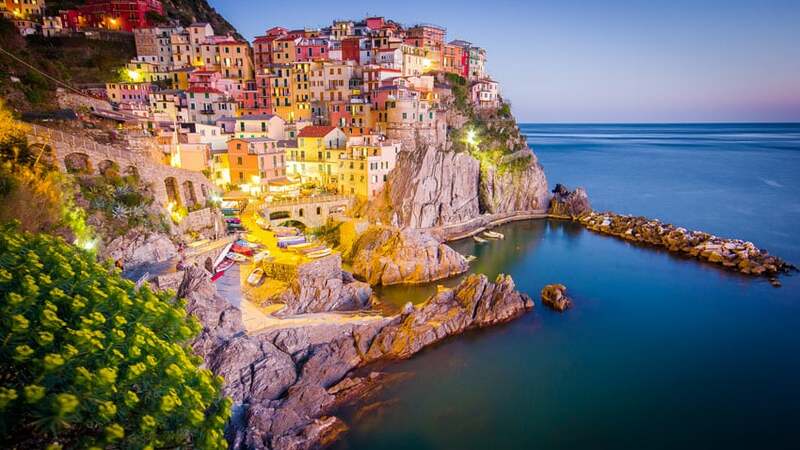 2) MANAROLA: Arguably one of the most photographed towns in Cinque Terre, Manarola is a beautiful place to explore and of course grab a bite to eat! I swear that every time I visit Manarola I put on 4kg in weight! The gelato, the calamari, the wine … it’s all just too good! 3) CORNIGLIA: Unlike the four other Cinque Terre towns, Corniglia is not perched right on the seafront, but some 100 meters high on the cliff-top. Attention: trying to walk this in the blistering heat at midday could be a bad idea – you could just end up sweaty, hot, dehydrated and no doubt in a bit of a mess  you can use the connecting shuttle bus from the train station, it only takes 5 minutes or so. A perfect place to enjoy the views of this magnificent area! 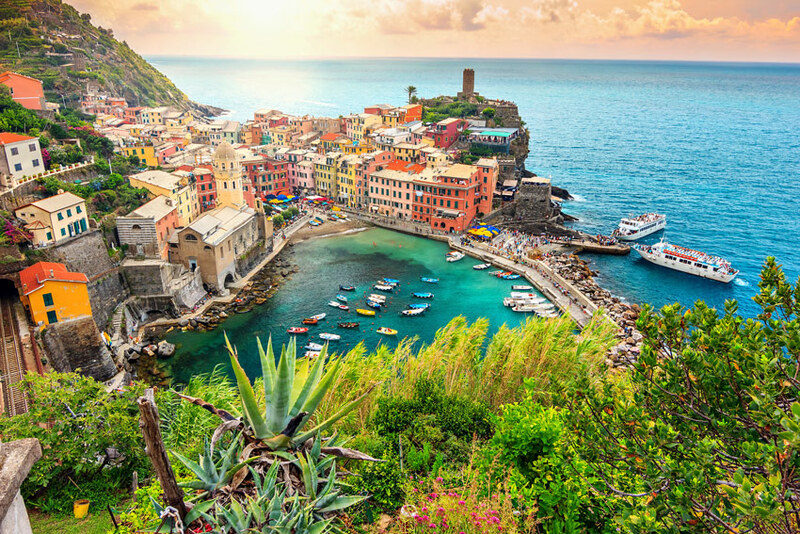 4) VERNAZZA: Dating back almost 1000 years, iconic Vernazza still stands to show you a beautiful piece of historic Italian charm – that I fall in love with again and again. This town really stole my heart! Don’t forget to see the Church of Santa Margherita and Vernazza’s hidden beach just off Piazza Marconi. Just minutes from La Spezia center. Clean spacious rooms with kitchen. 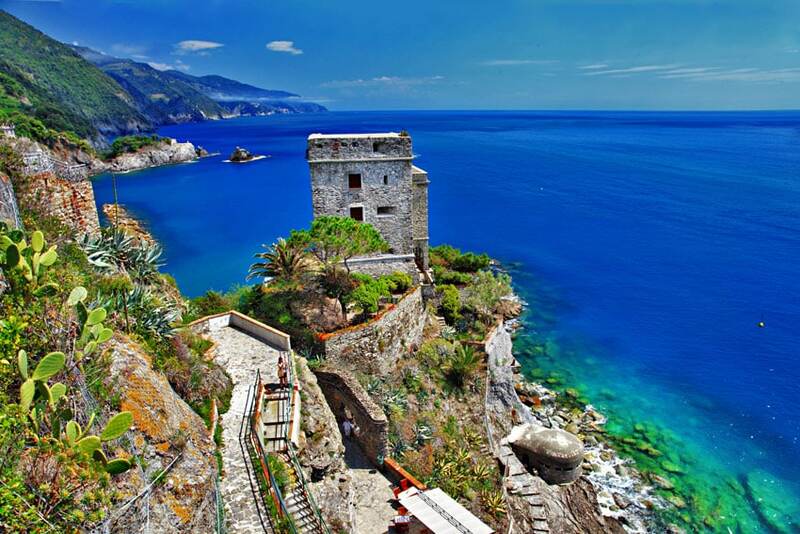 Good option to have a base there for your La Spezia Gulf, or Cinque Terre trips. Safe private parking and simple breakfast. The train station is at walking distance, and a safe free parking is a plus. Highly recommended. Check out this Hotel! 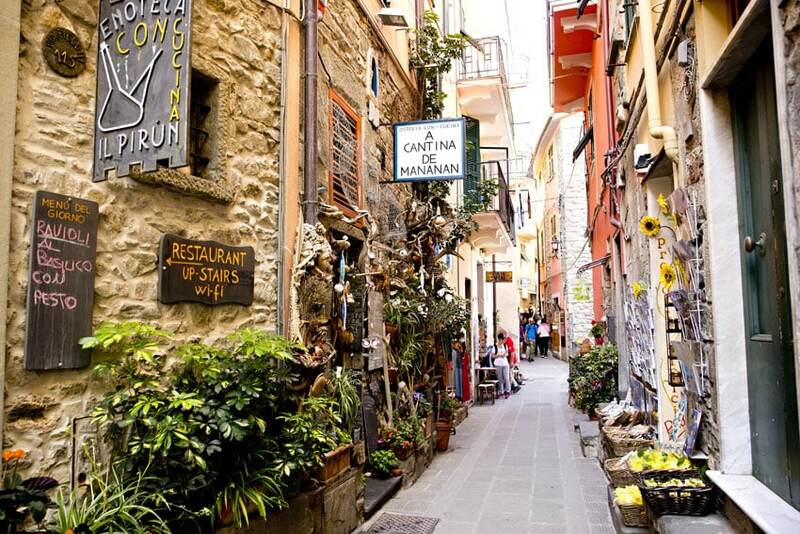 When it comes to visiting the villages in Cinque Terre, you can take your time and explore it by yourself or book a guided tour to discover the secret spots, the best restaurants, and the panoramic views. On of the best ones is definitely from Florence to Cinque Terre and it’s most suitable if you are flexible with your dates and are on an Italy road trip coming from the south and ending in the northern part of the country, like this one. Depending on your budget, some of these tours, especially the one by boat, are really worth the money spent. They will provide you with a totally different experience. As usual… it’s up to you! I sometimes like going on a tour and other times I prefer to discover an area by myself. I lived in Turin for 8 years while studying at University and not only I know the city very well but I love it to pieces! Unfortunately, the city is one of Italy’s most unsung cities. While most travelers to Italy head to the triptych Rome-Florence-Venice, Turin appears to remain off the tourists’ radar. Such a pity! It seems that, nowadays, the city is merely associated with Agnelli and its automobile empire. However, that would be forgetting that eight decades earlier another dynasty, not an industrial one, but a royal one chose Turin as its capital. Nineteenth-century Turin was also a favorite among intellectuals and artists, such as Nietzsche, who liked the city for its austere elegance, its atmosphere, its literary cafés, and its food. 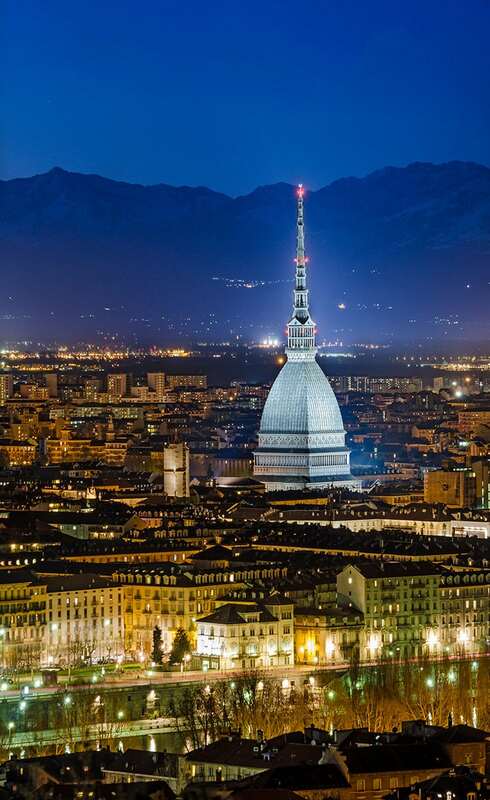 The beauty of Turin, compared to other Italian cities is that it is so easy to walk around. I didn’t have a car for 8 years and I know every single street, as you can easily walk from the city center to some of the most beautiful buildings and plazas around. Il Quadrilatero Romano: One of my favorite places in Turin for its many restaurants, aperitife bars and lovely streets, filled with history from the Roman empire. Great for an interesting night out in Turin! La Gran Madre Church: The church of Gran Madre di Dio is a Neoclassic-style church located in front of Piazza Vittorio Veneto, at the western side of the bridge dedicated to Vittorio Emanuele I. Very easy to reach by foot from Piazza Castello through via Po (filled with shops and restaurants), it’s very beautiful at night. Il Castello /Parco Del Valentino: My favorite spot in town, a massive park with botanical gardens, statues and, of course, the iconic castle. Perfect for a romantic walk or just to chill during the hot days of summer. You can admire the spectacular views of the Valentino Castel by night just crossing one of the bridges over the river PO. Highly recommended! La Reggia di Venaria: Declared UNESCO Heritage Site, the Reggia di Venaria is a Landmark that cannot be missed. 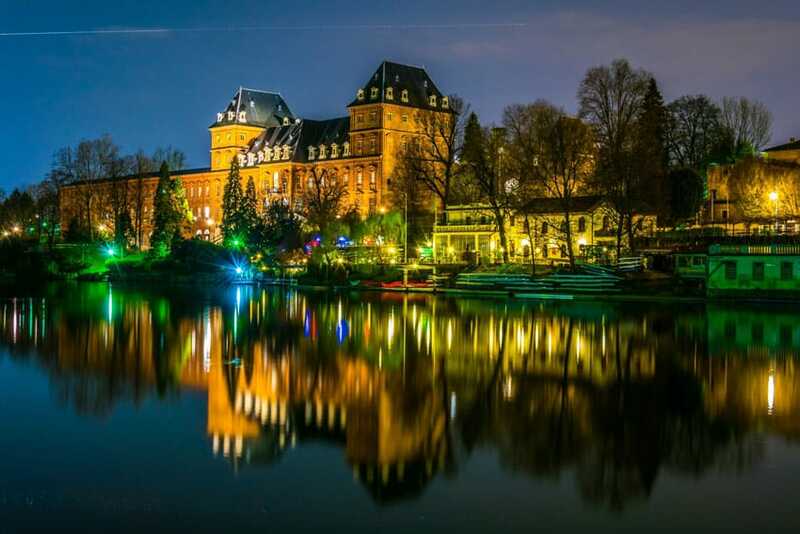 The palace is marvelous and during summer time, you can enjoy a wide array of events, from artists performing accompanied by relaxing music to video-mapping shows. Basilica di Superga: Another amazing place to visit in Turin! The church is set on a hill and you can admire the city from above, perfect at sunset to see the city lights and chill after a mandatory visit to the inside of the beautiful Basilica. The beautiful Castello del Valentino in the Valentino Park. One of my most precious places in Turin. Day or night it is truly marvelous! Museo Egizio: A great place for people passionate with Egyptian History, this museum is the most important one in Italy as it preserves some very rare mummified remains and several Egyptian statues. Palazzo Reale (Royal Palace): Located in Piazza Castello, If you visit it, I promise that the inside will leave you totally speechless. I still remember the first time I went there, admiring in awe the beautiful dancing room, the statues, the paintings and the seemingly never-ending luxury rooms. No wonder it was included in the list of World Heritage sites in 1997. Totally worth it! La Mole Antonelliana: This spectacular building, towering the city of Turin is the equivalent of the Colosseum in Rome. 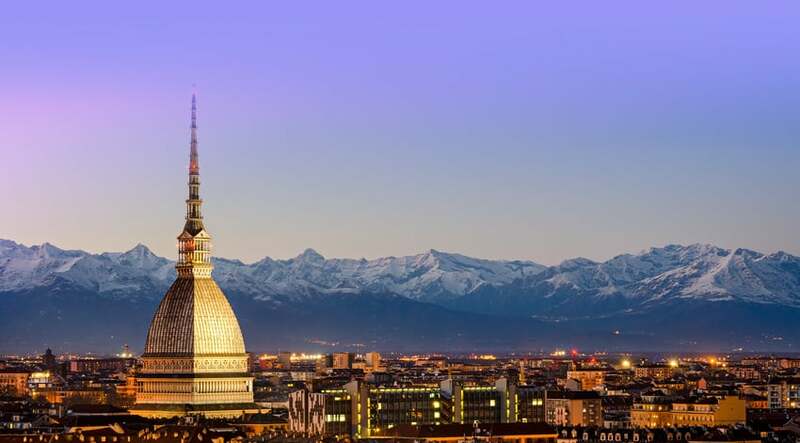 You can’t visit Turin without seeing it! Even from the outside you will be impressed by its majestic size and once inside you can take a transparent elevator, located right in the middle of the building that will take you to the top. At the ground floor there are usually very interesting art expositions. 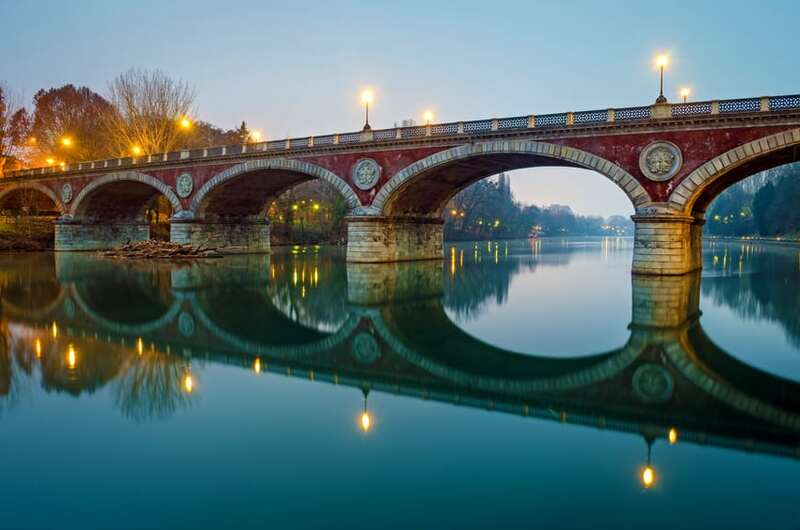 The beauty of Turin at sunset: Ponte Isabella over the River Po that divides the city in two. Excellent location to head off in any direction and explore. The hotel itself is lovely. Very helpful and friendly reception staff. Delicious breakfast, lovely rooms and parking space. The perfect mix to set you up for the day and relax once back from your strolling in Turin. Check out this Hotel! Milan is one of the coolest cities in Italy. It is the city of fashion and the economic capital of Italy, which are both quite clearly visible when you’re walking around. There are modern and trendy skyscrapers dotted here and there, surrounded by beautiful historical buildings all over the city center. Many of its most interesting sights and attractions are not readily apparent, so you’ll need to dig a little deeper to discover the gems that really make the city unique. Luckily, Milan is surprisingly walkable and at times feels more like a compact town than a major European metropolis. And once you start chipping away at its foreboding exterior, you’ll find untold treasures below the surface: priceless works of art, eccentric beautiful buildings, world-class restaurants and oases of calm. Explore the best things to do in Milan and remember: appearances aren’t everything. Como is filled with luxury Villas you can visit, like Villa Balbianello here, perfect setting even for weddings! 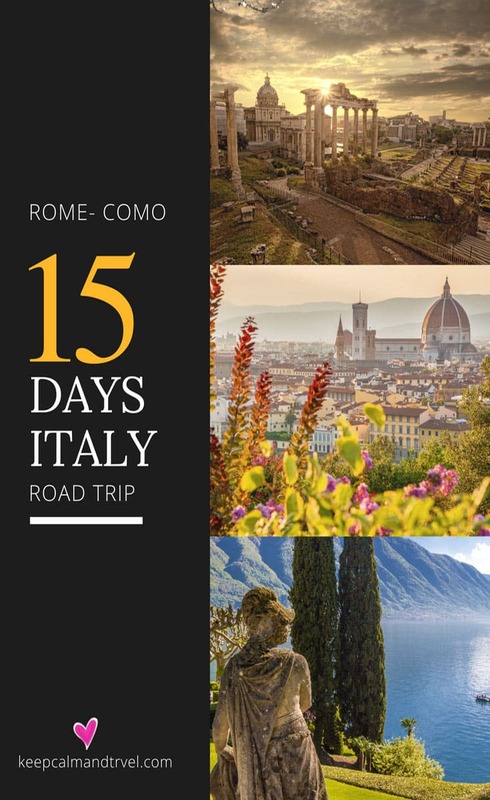 The itinerary for your Italy Road trip started in the glorious city of Rome and it couldn’t end in a less glorious fashion in the amazing Lake Como’s setting. Relax in the shade of a tree on Lake Como and admire its beautiful views … nd, who knows? 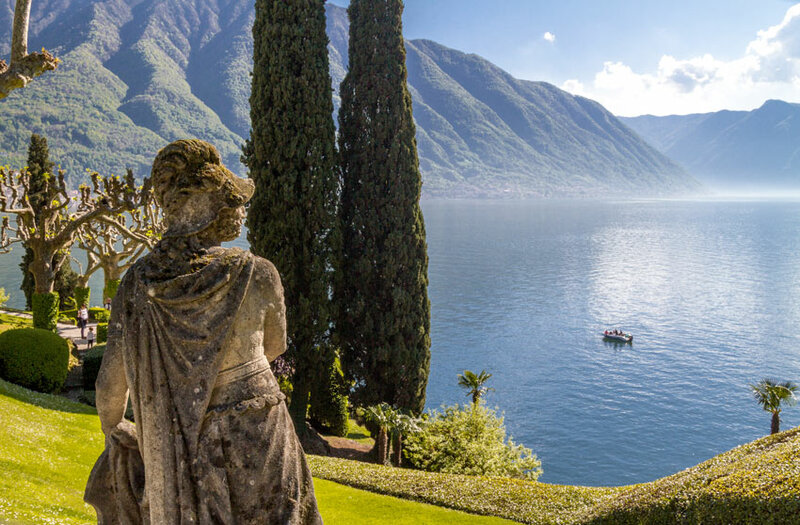 You might even spot George Clooney(owner of one of the most beautiful villas in Lake Como), his buddy Brad Pitt, Tom Cruise or in fact any other A-list visitor here, but there’s so much more to this destination than its famed visitors. The glacial lake Como is a mere 1.5 hour’s drive north of Milan and only 30 minutes or so from the border of Switzerland. For me, the biggest draw to Lake Como is its natural beauty – especially the dramatic mountainous region that always draws me in! Don’t forget to hop on the ferries that cross the lake, it’s a perfect way to explore the beautiful towns surround it like Menaggio, Bellagio, and Varenna, to mention but a few of my favorites. In Milan, as previously stated, is actually super easy to get around, either by walking a bit or via their efficient public services (the underground metropolitan system is very good). This way you will able to do quite a lot in one day. The famous Duomo di Milano, the symbol of the city. Parco Sempione to end your day in total relax! Honestly? If it was for me (personal taste!) I would spend just half day in Milan and aim straight to Lake Como, but the itinerary is yours so maybe you are a fashion addict and want to spend a whole afternoon shopping in Milan 🙂 Either way, Lake Como would deserve at least 2 days of exploring in my books! So, what to do and see in Lake Como? Il Duomo Di Milano: Do I really need to tell you why you should visit it? There is so much info online already and the pictures speak for themselves. It goes without saying that this should be your first stop in Milan, no question about it. And it’s as beautiful as the pictures would suggest. My only tip: Go there super early in the morning, you will make the most out of the experience! 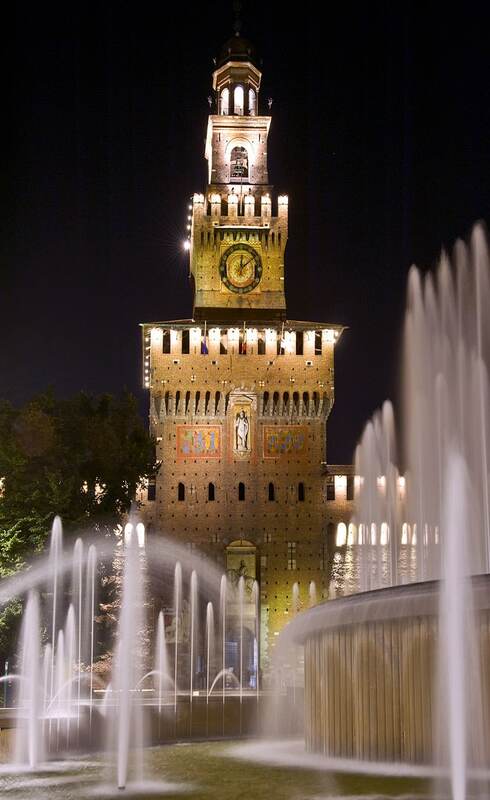 Castello Sforzesco: Nearby the Parco Sempione, The Castello Sforzesco (Sforza Castel) is also a mandatory stop on your visit to Milan, set aside for its famous towers, it hosts several museums from the Ancient Arts to the Pinacoteca and the Egyptian museum, just to name a few. If you love history, this is a great place to visit. Galleria Vittorio Emanuele II: Just on the left side of the Duomo di Milano, it’s architecture (especially the roof) will leave you in awe. You’ll find all sort of shops, from luxury ones to nice cafes where you can sip an espresso and relax, bookstores, restaurants and more. 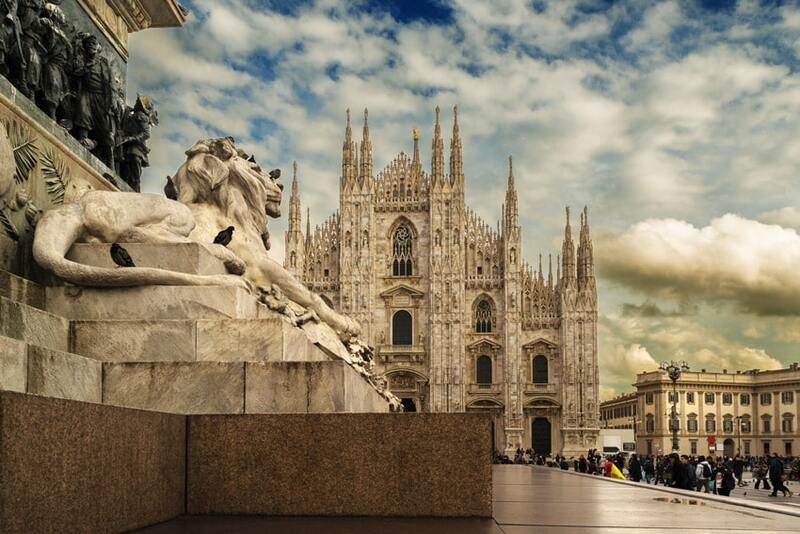 Since it’s in Piazza Duomo, you can easily make it your second stop in Milan. 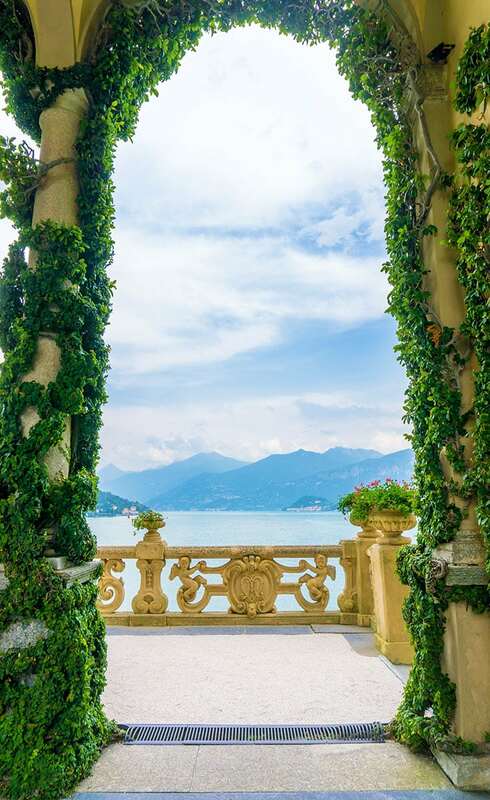 Villa Del Balbianello: Located on the left wing of the Lake, near the village of Lenno, it is a Must see for sure. Beautiful views of the Lake and the Villa itself with its terrace garden is truly out of this world! One of the best spots to admire Lake Como mighty beauty. It’s surely one of the most touristy and popular Villas to visit. Take the Ferry: One of the best ways to enjoy Lake Como is by Ferry. There are both public and private Ferries. The public one is quite cheap but obviously, it doesn’t let you hop off to explore what you want. 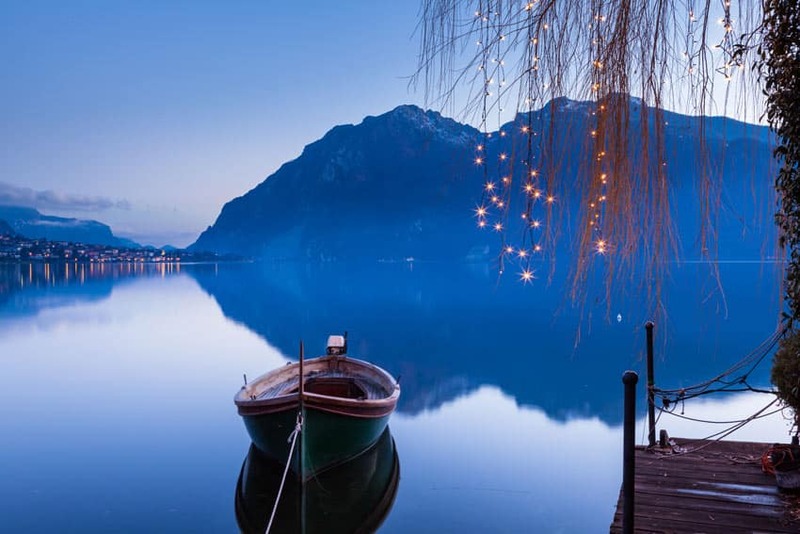 For the Private companies, you either find them online looking for “private ferry lake Como” or, as suggested below, I’d recommend the tour from Milan without the hassle to drive there and back. 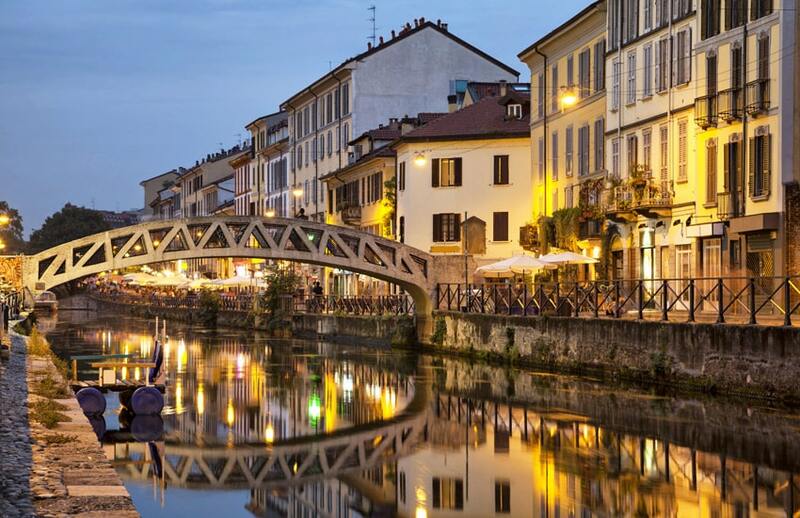 I Navigli Di Milano: A system of Canals running in the heart of Milan, filled with lovely cocktail bars, are the perfect location to spend your dinner and after-dinner hours, not to be missed for a great aperitif. Great for a romantic walk at sunset as well. It’s easy to reach by public transport which is always a bonus! Parco Sempione: Located in the heart of Milan, Parco Sempione is a lovely park where you can relax and chill and also visit the Sforza Castel and the Arch of peace, two of the most famous landmark in Milan… As for the Duomo, you can’t say you have seen Milan if you miss this spot! Via Montenapoleone: If you are in Milan and love Fashion, via Montenapoleone is the place you want to be! Filled with luxury shops, whatever brand you are looking for, you will find it there! Splurge as much as you want and enjoy! Trekking/hiking Lake Como: If you have some time or, during your Italy Road trip planning you decide to skip a place or two, this is one of the best and more rewarding activities to do, with breathtaking views over the lake. 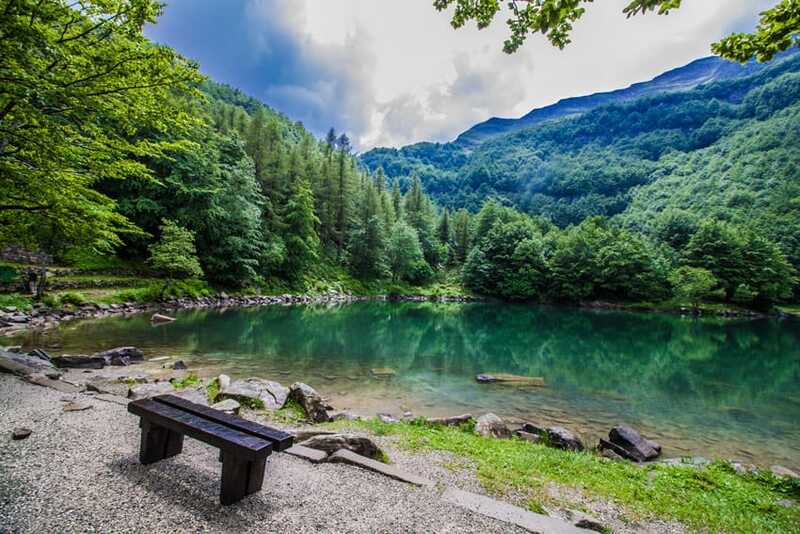 The most famous walks/hikes are the Greenway Del Lago and Spina Verde (suitable for everyone, they will take you to the top spots like Villa del Balbianello). For more advanced Trekking and Hiking, it’s better to organize with the private companies. Castello di Vezio: Located in the middle of the Lake Como, with an overview of Varenna village, it is a lovely spot for the jaw-dropping sights over the Lake and history provided. It was built over a thousand years ago. Don’t forget to climb its famous tower to enjoy even more incredible panoramic views! In the city center, accessed directly from Bellagio’s main square by 38 cobblestone steps, Hotel Bellagio is walking distance from the town’s shops, cafés, and restaurants. Parking available, free cancellation and incredible views on the lake of course. Check out this Hotel! If you prefer to take a day tour to Lake Como and base yourself in Milan, check out the NH PORTA NUOVA hotel, convenient and well located. Given the proximity of Lake Como with Milan, you can opt for booking one of the great tours from the Lombardy Capital, instead of spending money (and time) using your car. Many people choose this option and they are able to enjoy a full day in Lake Como without stress and seeing all the top sights stated above. Usually, when talking about the tours, I my advice is to decide either way (car or tour) but in this specific case, the day trips from Milan are truly the best option, also money-wise. Highly recommended! BONUS TIP: HOW TO SAVE MONEY ON YOUR HOTEL BOOKING WITH PRUVO! Let me start with a straightforward statement. I have been traveling the world since 2012 and booked countless hotels online (trying to find good deals of course) and I usually don’t trust online services. With Pruvo? Darn! I wish they had created this service years ago and that I had discovered it as soon as it was available! Fair enough! It’s super easy, so first watch the 3-minute video where they explain in detail what the service is about, using screenshots showing the steps one by one as they were actually booking a hotel, and then how much they saved by using Pruvo. If you can’t watch the video right now, no worries… I’ll wrap it up in my final recap! WATCH THIS EASY VIDEO TO SEE HOW IT WORKS! I want you to learn from my mistakes: Just like everyone else…I also tried to save money by booking very cheap hotels and I usually ended up ruining my trip and (how ironic) not even saving money! It’s not ALWAYS like this but, more often than not, the cheapest hotels are not in the center, but in rather shady areas without many amenities, connections and restaurant in sight, so I had to spend money on taxis and buses to go back and forth. Not a great deal, right? What I do now, and you should do as well! 1) Book at least 2 or 3 hotels that have a clear cancellation policy You can use whatever hotel you want, as long as you can cancel the reservation. This way you can decide last minute which hotel is right for you. 2) Forward the reservations to save@pruvo.net One email for each reservation so that they can monitor any price drop from the hotels you have chosen (usually prices drop if they are not fully booked a few days before your stay). 3) Re-book at a better price: Just sit comfortably and wait to receive an email from Pruvo. When they find that the prices for the hotel you have booked (with the same dates and same room) have dropped, you can book it again with the cheaper price, deleting your old reservation. All this for free, how cool is that!? Please note that the price drops depend on the hotels and sometimes they remain the same but most of them usually decrease the price last minute and if that happens, Pruvo will catch them and let you know immediately! This is pretty much it! straightforward, simple and totally free! If you want to know more about their service or contact them for any reason, you can check out their website pruvo.net. You can book any hotel you like (not just booking.com) and use Pruvo, as long as you book a room that has a clear cancellation policy you can easily save money. As you might have noticed, I tried to fit in as many “pit stop” as possible for your 15 days on the road in Italy. I know many people would rather rush a bit to be able to see as many beautiful spots as possible. That said, If you want to travel slower and stay more in one place you can easily rearrange this itinerary by simply skip a few places, no problem! I hope you enjoyed my article and that you will be inspired to visit my beautiful Italy, loving my country as much as I do! If you have any question or locations you have visited that you particularly liked, shoot me a message in the comments below, I’d love to hear your experience! Hello Clelia, these itineraries are just amazing for a traveler. Is it budget friendly for a solo traveler or its better to be with a group tour? Lovely Post. Italy such a wonderful place to visit. All the photos are very good. This is an informative post. Thank you so much for sharing the list. I would like to share with my friends. 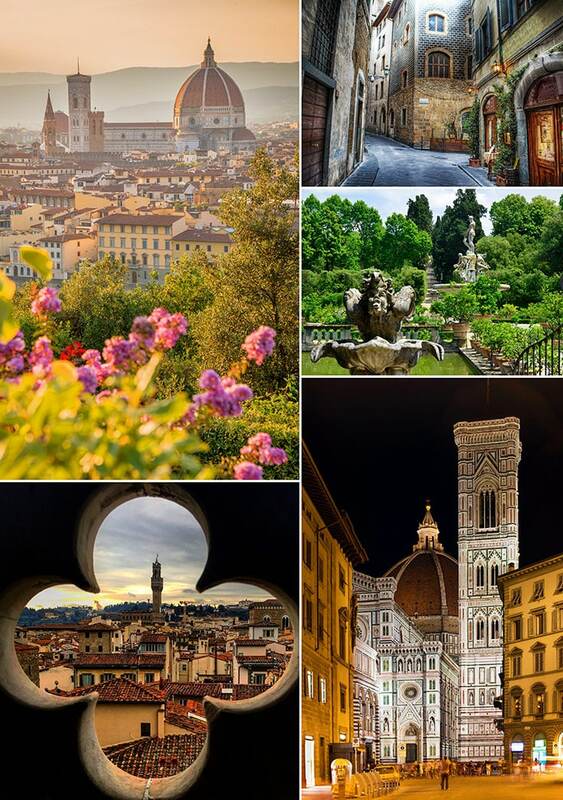 I have been reading your posts regularly.I need to say that you are doing a fantastic job by posting information regarding Italian beautiful and tour places.I will bookmark your site Please keep up the great work. thanks for sharing this! Love Italy! Oh man what a post! Lake Como, the italian tastes, the eye-candy accommodation… Have mercy! Never thought about a road trip round Europe but this looks amazing. I would want to take in San Marino for sure. Went to Italy in 2016, was one of our favorite countries to visit, need to get back ASAP! Sounds a great way of giving a treat to myself and my wife for our anniversary! thanks for sharing this post, Italy is really very amazing and awesome, I can’t wait to visit one day!! Love this article! Going to Europe for a 2 month road trip this summer. This Italy road trip will fit in perfectly with my plan. Thank you! I’ve mostly been a UK and France traveler, but the more I see and read about Italy, especially the ancient cities … ! Thanks for a great post. Your photos are amazing! I’m off to see what airfare looks like for next season! Thanks for an informative post, Clelia! It is very well-written, as well. I love how you included a video to teach your readers on how they can make use of Pruvo. Italy has always been a place to visit and explore for me but have not gotten the chance to fulfill at this time. It’s also nice that lots of airlines these days are getting better with air travel services and amenities. Kudos! Italy is the perfect place to visit and I would love to explore it more. You captured awesome pictures on your travel trip. Thank you so much for sharing this post..
Wow! This post sounds amazing.. Italy looks awesome to explore. There are so many things to do. Love your post. I will be definitely adding to my bucket list. Keep posting! I think everyone would like Venice in Italy. Venice was my favorite place where I would like to hang out with friends. Italy sounds different and so appealing in this post. Loved the detailing! It was such a good read. Thank you. I appreciate your blog post, Thanks for sharing. Air travel gets easier with airline sophistication. Its invention has revolutionized the entire travel arena. Italy is a perfect place to travel as every city is to beatiful and historical. My favorite was Florence from the very well known ones but as I prefer less touristic destinations I enjoyed Bologna too for the students vibe.